Why the sudden interested in Leland, NC? Its prime location, just five minutes west of Wilmington, NC, offers easy access to the conveniences of a larger city (it takes less time to get to Wilmington's downtown than it does from most neighborhoods in the city!). Furthermore, Leland also offers spacious, affordable luxury housing options that are proving to be wise investments. Today, Leland carries the distinction not only as the "The Gateway to Brunswick County", but also as one of the fastest-growing towns in the nation. The centerpiece of northern Brunswick County, Leland has always been rich in natural beauty. The town is nestled along the west banks of the Brunswick River and Sturgeon Creek, making it popular with kayakers and nature lovers.Yet its continued population growth is also attracting economic wealth as new businesses flock to the area to meet the needs and demands of its residents. With a modern business corridor along Highway 17 and easy accessibility to the attractions, restaurants, nightlife, and cultural opportunities available in Wilmington, NC and Myrtle Beach, SC, Leland is a very desirable location for retirees and residents relocating to both Brunswick and New Hanover Counties. Home to beautiful championship golf courses, over fifty places of worship, and a vibrant business community, the Town of Leland is a great place to put down roots. The temperate climate and proximity to the ocean allow residents to enjoy year-round golf, hiking, biking, kayaking, and family outings. As a neighbor to Wilmington, Southport, Myrtle Beach, and dozens of beautiful beaches, Leland is not only The Gateway to Brunswick County, but a gateway to hundreds of leisure and lifestyle options. Recreational opportunities, cultural events, educational institutions, museums and more are all just a short drive away. Consequently, Leland residents enjoy both the perks of small town living (like larger land plots and greater privacy) and the benefits of vibrant city life (performing arts venues, boutiques, great restaurants and nightlife), just minutes away. Leland is home to a beautiful championship golf course at Magnolia Greens, several parks and trails, and Sturgeon Creek and Mill Creek, which run through Leland and empty into the Brunswick River. The creeks are popular destinations for kayakers and nature enthusiasts. Leland has a public kayak launch off of Village Road. There is also a larger public water access approximately 1 mile from Hwy 17 on Hwy 133 on the Brunswick River. Numerous churches, a library, a growing business community, and a branch of Brunswick Community College just outside the town limits, make Leland a great place to put down roots. Leland rested at the crossroads of the area railroad and ports along the river, making it an ideal location for temporary stops during the nineteenth century. Over time, Leland evolved into a small town that linked large homes dotting the countryside. The town didn't officially incorporate until 1989. But it was just a decade ago, that Leland began its population explosion from 1,800 to more than 10,000 residents. When it comes to economy and local government, Leland, NC is riding a great wave. As a direct result of the population explosion, Leland has enjoyed continued geographic and economic expansion. Recently, the town has seen the opening of a business corridor with a number of commercial centers, businesses, restaurants and, of course, the obligatory Wal-Mart. Hotels, grocery stores, national retailers, and more restaurants are opening at regular intervals. Two industrial parks serve as strong economic contributors to the area. North Brunswick High School, Leland Middle School, and a nearby branch of Brunswick County Community College are also large employers. The dynamic economic environment of Leland is partly due to the voluntary annexation of the Brunswick Forest development. This 4,900-acre tract joined the town's other flagship developments – Magnolia Greens, Waterford, Mallory Creek, Westport and Westgate – making Leland the largest municipality in Brunswick County. When Brunswick Forest is completed it will add nearly 10,000 new residents to the area. The town of Belville, a smaller town adjacent to Leland, and the towns of Supply, Navassa, Winnabow, and Bolivia share not only in the lush natural of the area, but also in the economic windfall that Leland has recently enjoyed. With its warm climate, low tax rate, beautiful natural amenities, and strategic location providing convenient access to Wilmington, Myrtle Beach, Southport, Leland was literally made for retirees. Planned residential communities like Magnolia Greens, Waterford, Compass Pointe and Brunswick Forest, were designed to offer the best in lifestyle, amenities and location. In fact, Brunswick Forest is the fastest growing community in the coastal South, boasting a network of more than 100 miles of paved and unpaved paths and trails connecting the community's neighborhoods to all the amenities, parks and natural areas found throughout the 4,900 acre reserve on which it was planned. Despite its rapid population growth, Leland is committed to maintaining a small-town atmosphere and a strong quality of life as it enters its era of growth and prosperity. The Town of Leland has been able to structure growth so that core businesses are located in consolidated areas, providing easy access and close proximity to stores, restaurants and services. Yet, Brunswick County remains largely rural: within a couple moments you can find yourself in the country, surrounded by farms and animals. Its mild climate, neighboring beach communities, and abundance of recreational opportunities make Leland a delightfully relaxed, but vibrant community. Leland shares much of the same scenic backdrop as neighboring Wilmington, boasting everything from waterfront properties to gated communities with their own private parks. New homes in Leland are available in family-friendly communities with tree-lined streets, and lush greenery. There are limitless options in and around Leland: land, country properties, custom home builder, first-time buyer homes, and luxury homes to name a few. 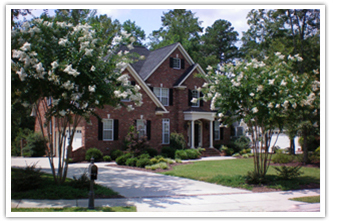 Leland and Brunswick County are home to many new residential neighborhoods including: Magnolia Greens, Waterford, Mallory Creek, Compass Pointe, Westport, Westgate, and Brunswick Forest. Located in a setting of unmatched beauty in a lush landscape of pristine forest, Brunswick Forest is an approximately 4,900-acre retreat and the fastest growing community on the Carolina coast. Highland Shores, a riverfront community just two miles south of the first Leland exit and located on the banks of the Brunswick River, is an upscale family-oriented neighborhood that boasts a clubhouse, a pool, and a multi-slip boat dock with gazebo. Whether you're considering a luxury home on a large plot of land in a nature reserve or a modest patio home in a family-friendly community, Leland provides relaxed ambiance and convenience just a "hop, skip, and a jump" from Wilmington, Southport, and Myrtle Beach. If you would like to own a property in this booming area with tremendous economic and real estate investment potential, please Contact Us today. Ready to Search for Leland Homes for Sale?